First comes the realization that birds migrate. Svalbard, 1594 – the perceptive Gerrit de Veer noticed geese. He thought they were Brant, similar to the ‘ducks’ he knew from the Netherlands. 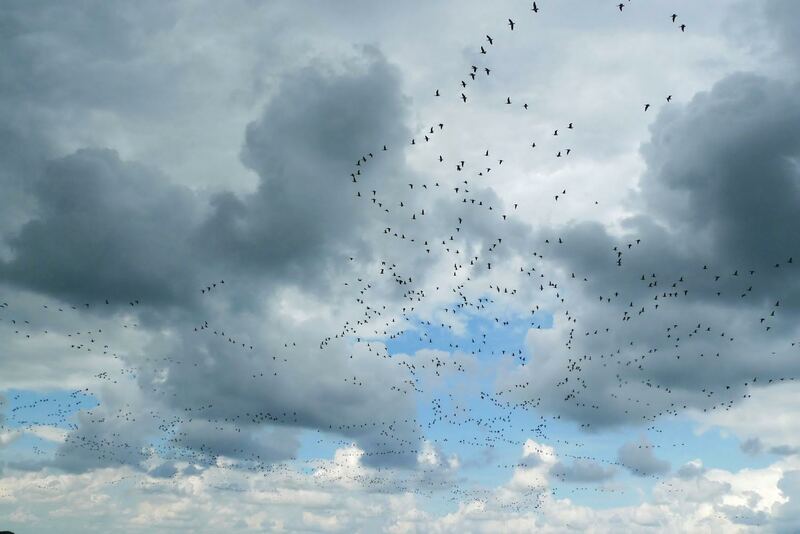 De Veer wrote down a tentative remark in his Journals – could these geese winter in the Wadden area, and summer in the arctic? They tasted similar too! The hypothesis was definitively proven years later. The birds in the arctic were the very same as the birds back home, and they flew the distance twice each year. At some point, millions of years ago, these species had learned to travel each year. They became migratory birds, remarkable long-distance travellers of impressive athleticism. Migratory birds know the way by heart – long distances by invisible roads. They have an astounding ability for orientation and navigation, a skill that humans increasingly seem to be losing. Even more remarkable is how migratory birds know more than the average well-informed citizen of the world. They fly over dangerous places, on their way to strange places where coarse languages are spoken. Their map is the map of the world. Sometimes they observe things that should have stayed hidden, and we are left wondering what they’ve seen. The birds’ eye view implies a certain distance to the object of perception. Birds inspire a curiosity in us because they are windows to the world. How do you follow birds? Sit still, stand still or travel, all the while observing with care. Watch sharply for birds that have been ringed or otherwise tagged. Nowadays, expert bird-followers track migratory routes via GPS. Then and now, the collected data are carefully recorded on maps. When plotted on a map of the world, the bird observations form a cloud of dots and lines – a cloud that, in the 1970’s, was named the East Atlantic Flyway. The East Atlantic Flyway is an imaginary highway that connects the Wadden Sea with the Atlantic coast of Africa, and heads north towards the Arctic sea.